The woman was Huang Yijun from China. When she was 31 in 1948, she became pregnant only to find out that she had an ectopic pregnancy, meaning the egg had not attached in the uterus. In most ectopic pregnancies, the egg will implant in the Fallopian tubes, but in Huang’s case, the egg implanted just outside her Fallopian tubes causing what is known as an “abdominal pregnancy”. These are very rare, with only about 1% of all ectopic pregnancies falling into this category (about .0001% of all pregnancies). In abdominal pregnancies, the embryo often attaches to organs inside the abdomen, and can even attach to such things as a woman’s liver, diaphragm, bowels, or spleen. Surprisingly, an abdominal pregnancy is not necessarily a death sentence for the growing baby, though there are significant risks to the mother and baby and the few such babies who do end up surviving have a 21% chance of having birth defects in part due to lack of amniotic fluid buffer and more compression than the baby would otherwise experience in the uterus. In Huang’s case, the baby did not survive. If the baby dies when it is small enough, the tissues will typically break down and the body will get rid of it naturally. 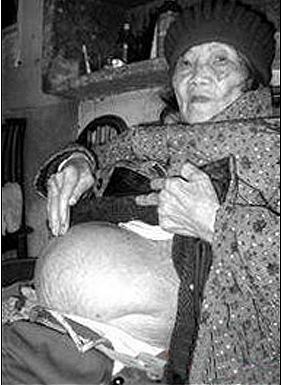 In Huang’s case, though, the baby was large enough that her body was unable to get rid of it. In cases where the baby is too large for the body to get rid of it, instead calcium deposits will build up around the dead tissue, turning the fetus into a “stone baby”, or more technically a “lithopedion”. Women who have this happen are often unaware of it- in known cases of stone babies, the average time-span of carrying the fetus is about 22 years because of this. The women can often even have other children, despite the presence of the stone baby. Of course, in Huang’s case, she was well aware of the presence of the “stone baby”, simply unable to afford to get rid of it. This all changed in 2009 when Huang was 92 years old. At that point, after having carried the fetus for 60 years, she finally had it removed. While lithopedion was first described in the 10th century by Albucasis, the first famous case of a stone baby was from a 68 year old woman named Colombe Chatri from France in 1582. For about 28 years of Chatri’s life, she’d complained of abdominal pain and there was definitely some large, very hard mass in her abdomen. When Chatri died, an autopsy was performed, at which point the physician discovered the stone baby. This particular calcified fetus was then sold, as well as drawings of it- which sold like hotcakes. The fetus was passed around over the years before finally ending up in the Danish Museum of Natural History, and was subsequently lost. The earliest known case of a lithopedion was discovered by archaeologists who found a stone baby whose mother had lived around 1100 BC. While the actual number is probably much larger due to the women often not knowing of their calcified fetuses, to date only about 300 cases of lithopedion have been documented.